In a market where there are constant advances in nano-technology, Polishworks has spent countless hours and thousands of dollars investing in the researching in the latest Protective Paint Coatings for your vehicle. With over 7 years of experience installing professional-grade nano coatings our research has led us to Modesta. Modesta Glass Coatings are thick & silica-based, like traditional coatings – but provide even more gloss & protection to paint, wheels, and paint protection film. When it comes to choosing a paint coating – it is very easy to be overwhelmed with product marketing claims and information. Through trial and error – we have tested countless coatings resulting in the Modesta Paint Coating line as the top performer. With Modesta applied to your paintwork and/or paint protection film, you will not need to apply traditional waxes or sealants for protection, so maintenance is incredibly easy with simple washes and maintenance sprays. We recommend annual inspections of the coating to insure it is performing at its optimal level. It is imperative that we completely remove all defects from the paintwork before we lock the finish with our protective coatings. This is a process that is executed only after a thorough degreasing and decontamination of the vehicle. Our polishing systems, methods & polishes ensure a pure, beautiful “filler-free” shine that is left completely virgin so that the bonding bonds properly. Once the paint has been perfected, We install a thick, glossy primer that ensures a perfect long lasting bond with your vehicle’s paintwork. This is only done once the paint is completely stripped of all polishing residue with 99% Iso-propyl alcohol. Modesta’sP-01A Primer is a highly advanced & unique primer used for Modesta liquid glass coatings. It contains a blend of high quality resins and additives capable of producing up to 10 microns on top of the paint. Once Applied, the paint is left to cure for 180 minutes before the coating process can begin. Slowly, Panel by panel we install a thick layer of the most pure SI02 on the planet. Each application is spread evenly consisting of approximately 2ML per panel. Where others install “ a few drops” per panel - this coating process ensures a durability, beauty & longevity. We use multiple applicators and extremely high quality microfiber towels during this process. Once the entire vehicle has been coated, we cure each panel at 140 degrees for 10-15 minutes. This cures the coating nearly twice as hard as if it were left without IR curing. Its important, too - to note that we utilize SHORT wave IR lamps, not medium or long wave. The use of other lamps is popular and not widely known amongst the coating industry as actually being detrimental to the coating being installed. Our Shortwave Lamps bake the outermost layer installed, not the entire body panel. 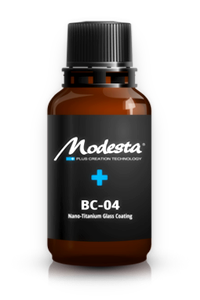 BC-04 combines the best advantages of the original Modesta Pure Liquid Glass coatings and highest quality nanograde titanium. This combination creates a deeper shine and better reflections on the paint. The inorganic nature of the coating makes it fully resistant to oxidation. The hard physical barrier it creates also prevents paint from coming into contact with air and acts as a antiscratch protectant. Modesta BC-04 is capable to withstand temperatures of up to 1,652 degrees Fahrenheit.